Additional Info: Over looks 4 acre fishing lake, French doors off master and 2nd bedrooms. Roll top bath recently fully refurbished inside and out. 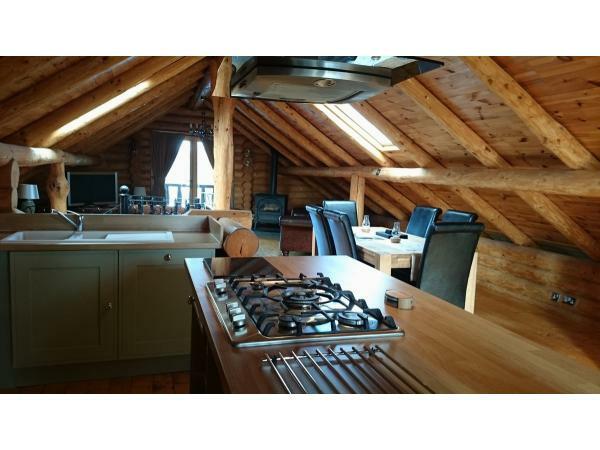 This very attractive timber-rolled lodge has private hot tub set on the water's edge of Duck Lake, over looking a picturesque 4-acre fishing lake. 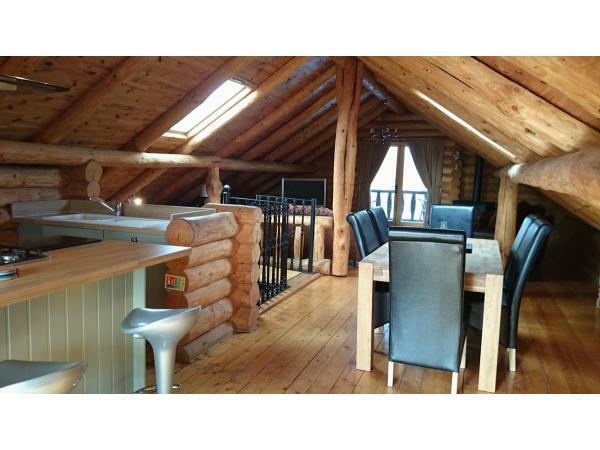 This lodge is tremendous and definitely has the WOW factor. A spiral staircase leads you up to the first floor where you will find the open plan living area, sloping ceilings with three velux windows with flooding natural light and a fitted kitchen, dining area. A very comfortable sitting area with 3 seater, 2 seater and a wicker arm chair, 50" TV with free view and DVD. French doors take you out to a veranda where you can enjoy breath-taking views over the lake all through the year. There are three ground floor bedrooms with two double rooms having French doors opening out onto the veranda which overlooks the lake. 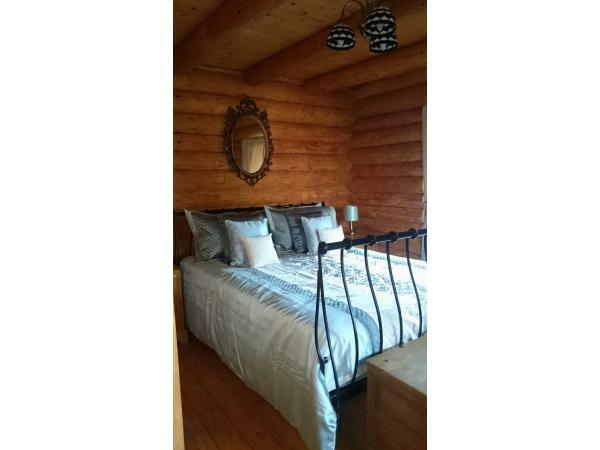 Their is bedroom furniture throughout in-keeping with the lodge. 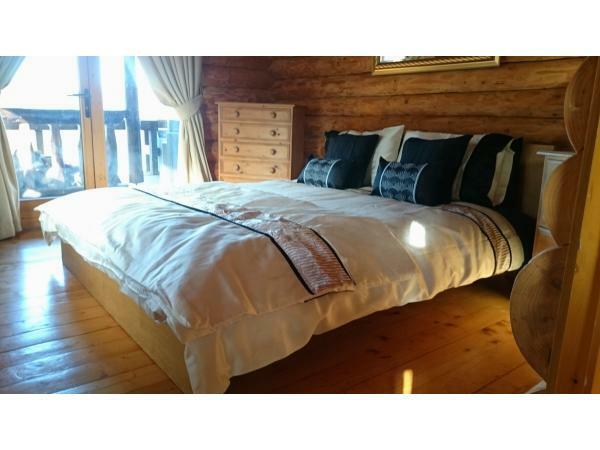 The master bedroom has a king size bed, TV and en-suite with roll top bath, basin and WC. 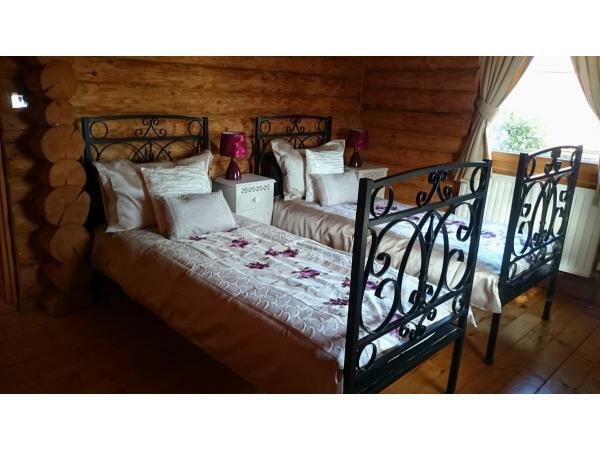 Bedroom 2 has a king size bed and a (shared Jack n Jill access) en-suite with shower, sink and WC with Bedroom 3 which has two twin beds. The sage kitchen is a dream and even you will try cooking that culinary masterpiece with 2 additional bar stools so that you can enjoy watching or joining in with the cooking. Well equipped with everything you would need pots, pans dishes etc. 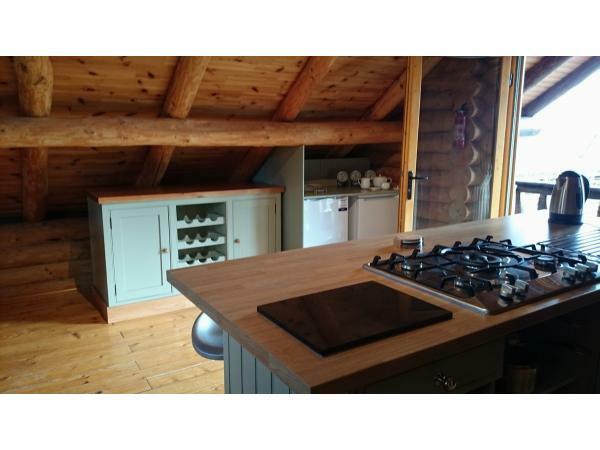 A double electric oven, 5 ring gas hob with wok burner, microwave, two fridges, built in freezer, dishwasher, toaster, liquidiser, slow cooker. You will also be able to use a shared coin-operated washing machine. 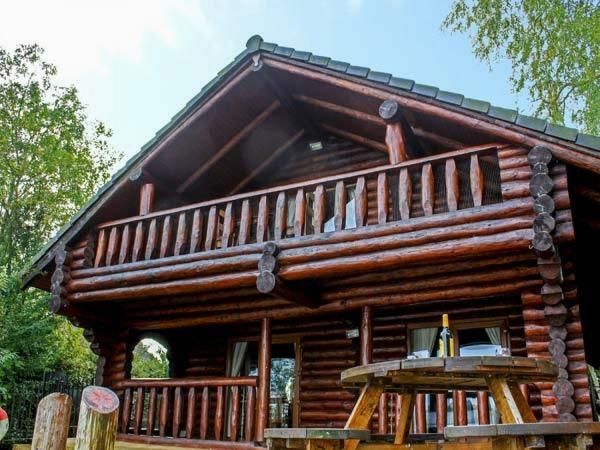 The lodge has gas central heating, bed linen and towels are included. You can access the lounge either from the front up the external wooden stairs or through the ground floor spiral staircase. No smoking allowed and 1 pet. (This is an additional charge please state at the time of booking). Unfortunately no hen/stag or similar parties sorry. 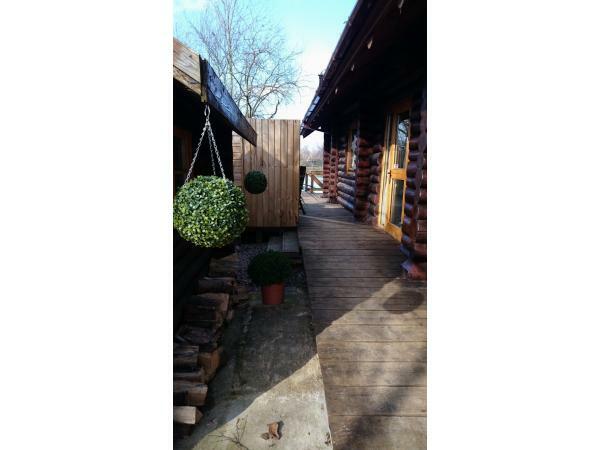 Outside there is a private parking area for 2 cars, and a side veranda which leads you to the lakeside. 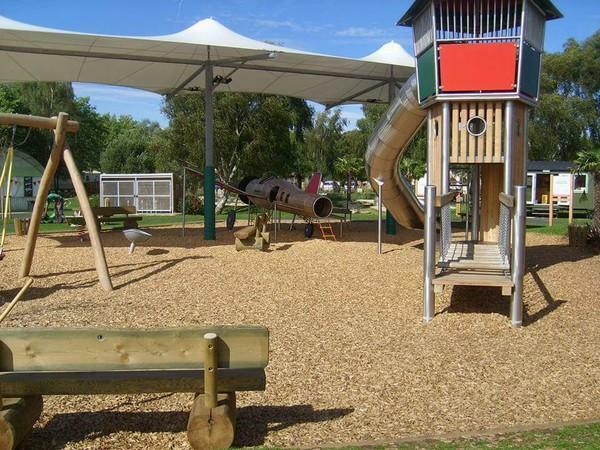 Here you will find the large covered veranda with table, chairs and sun loungers. 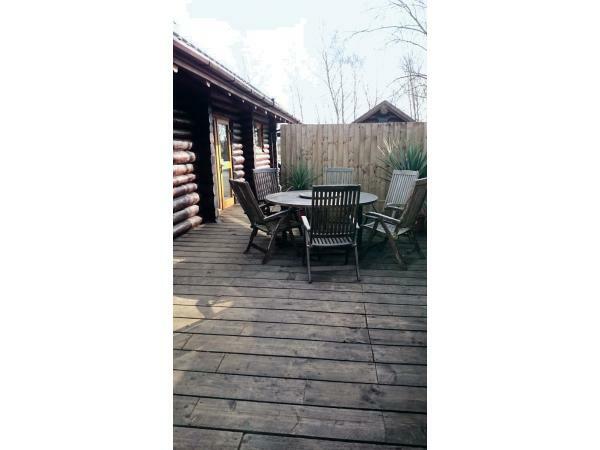 The luxurious hot tub is situated to the side for privacy (Please ensure that the hot tub cover is put on after use). Also, ensure that you read the guidelines for using the hot tub as these are there for your safety and others. The veranda is un-fenced at the waters edge and children must be supervised at all times. If you fancy a pizza why not make your own in the Pizza Oven or try sizzling those sausages on the BBQ (Always clean these items after use). The lodge has its own fishing peg and the sun sets perfectly on the veranda. Enjoy relaxing with a good book or take that well earned afternoon snooze. You will find a hoover, mop, sweeping brush and a few cleaning essentials under the sink for you to use during your stay. If you require any of the following items please state at the time of booking - highchair, travel cot. 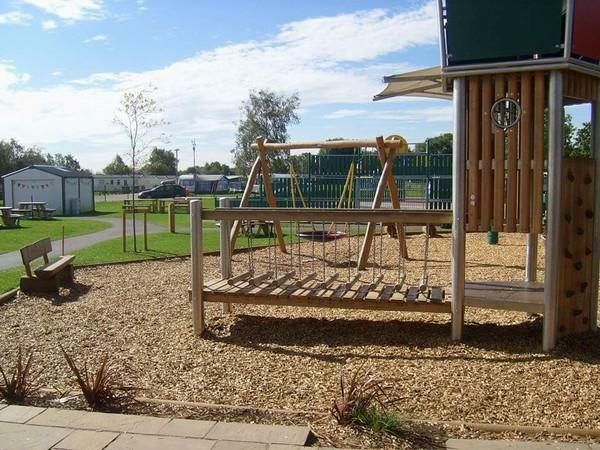 Additional Info: Pub/Club, Fishing, Amusement Arcade, Indoor Pool, Golf Course, Laundrette, Grocery Shop, Restaurant, Kids Club, Access to Spitfire Diner & Bar, Sauna, Steam Room, Hot Tub (For Adults Only Located Near Indoor Pool), My Active - Balanceability, Archery, Hoverball, Archery, Parent & Toddle Pool Time, Target Paintball, Waterwalkerz, Body Zorbing, Pool Kayaks, Crossbow, Raft Building, Cheerleading, Zumba Fitness, Axe Throwing, Enhanced Laser Tag, Hover Boards, Land Zorbing, Easy Breath Snorkelling Jet Ski's, Wakeboarding, Water Skiing, Swimming Lessons, Aquacise, 9 Hole Golf Course, Bike Hire.